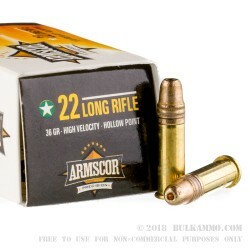 This 22LR ammunition is a perfect fit for all of your shooting needs. 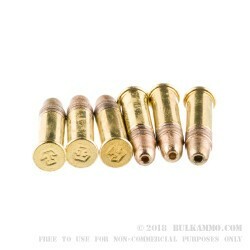 It is a fantastic range round and a great varmint hunting round. 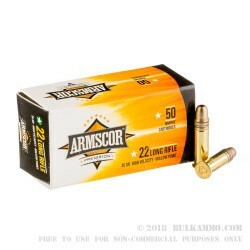 Each round in this 50 count box or ammo comes loaded with a lighter than average, 36 grain, copper plated hollow point bullet. This bullet is both lighter and faster than the normal 40 grain bullet, clocking in with a muzzle velocity of about 1,250 feet per second. 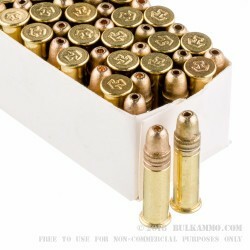 And for the price, this ammo should be at the top of your list of what to buy. Armscor is a Philippines base company, with manufacturing in the US and the Philippines. It is hard to tell the difference between the two, because of the attention to detail the Armscor puts into their manufacturing process. Q: What is the actual velocity of these rounds???? A: Hello Luis, Armscor lists the velocity of this round at 1260 fps.